On March 9, the Chaminade fencing traveled to Victorville, California to compete in the Victor Valley High School Fencing Tournament. The Eagles dominated the tournament taking first place in every event, except one. The Eagles finished first in Varsity A Men’s Foil, Varsity A Women’s Foil, Varsity B Men’s Foil, JV Men’s Foil, and Middle School Girl’s Foil. The middle school boy’s foil team finished third. In addition, Chaminade’s fencing team (13-14) took home the Southern California Scholastic Fencing League Overall 6-Weapon Trophy, beating Harvard Westlake by just one point. The trophy goes to the best overall team each season, tallying all team results from men’s foil, men’s epee, men’s saber, women’s foil, women’s epee and women’s saber events. Last year the Eagles were co-champions with Victor Valley High School. On Sunday, April 13, Chaminade will host the California State Fencing Championship, in the Uribe Sports Center on the West Hills campus. This entry was posted in Athletics, Fencing, High School, Middle School by Chaminade News. Bookmark the permalink. 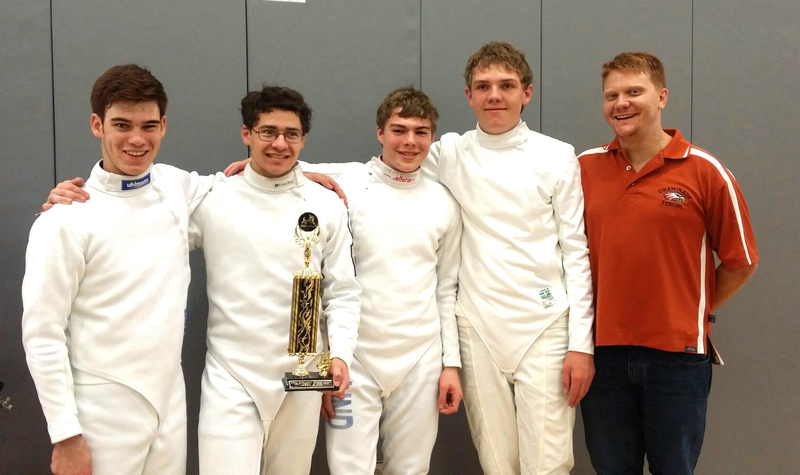 Great job Chaminade Fencing Eagles!! Congratulations to the team, and to our world-class coach Derek Snyder, and his excellent Assistant Coach Zoe. So proud of this team. A GREAT recruiting tool!